Seagram never watched a race. Instead, he would pick an infield dandelion and put it in his lapel before each race. He would then turnaround and visualize the race instead of watching it. 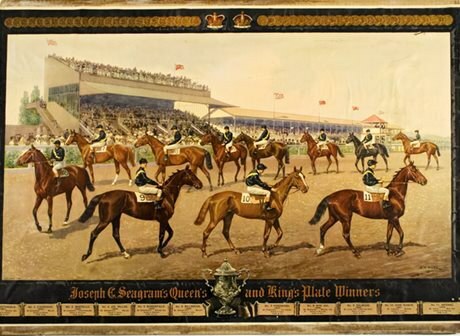 Joseph Seagram (1841-1919) was an immensely successful Ontario industrialist whose racehorses won the prestigious Queen’s and King’s plates 20 times. In his leisure time, Seagram developed a love for horse racing and established a 200-acre (81-hectare) stud farm in Waterloo in 1888. Seagram was instrumental in breeding and training thoroughbred racehorses by bringing brood mares from England. Inferno was one of his best horses, who won the King’s Plate, the King Edward Gold Cup three times, the Durham Cup twice and the Toronto Cup. Seagram’s signature brand of whisky, Crown Royal, was wrapped in a purple purse similar to that given to race winners. Seagram was inducted into the Canadian Horse Racing Hall of Fame in 1976. Learn more about the Seagram family from the University of Waterloo Library website. Read about Seagram’s induction into the Canadian Horse Racing Hall of Fame. Learn more about the history of the Queen’s Plate from the Woodbine Entertainment website.